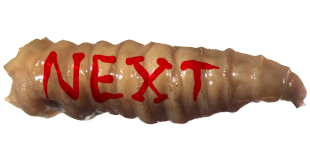 Will I be able to scrape together one more "miscellany" post? Let's find out! I missed this one in my Michael's review, since they always put the cheaper toys and candy out a few weeks after their early-bird decor and collectibles. 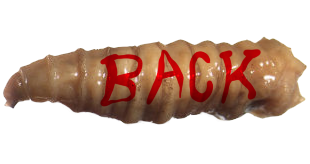 For just two bucks, you get a tiny can of blood-colored slime and a rubber eyeball friend that can both slurp it up and spew it out! Haven't you had enough, eyeball!? Slow down!!! Everything about this is so deliciously grisly. 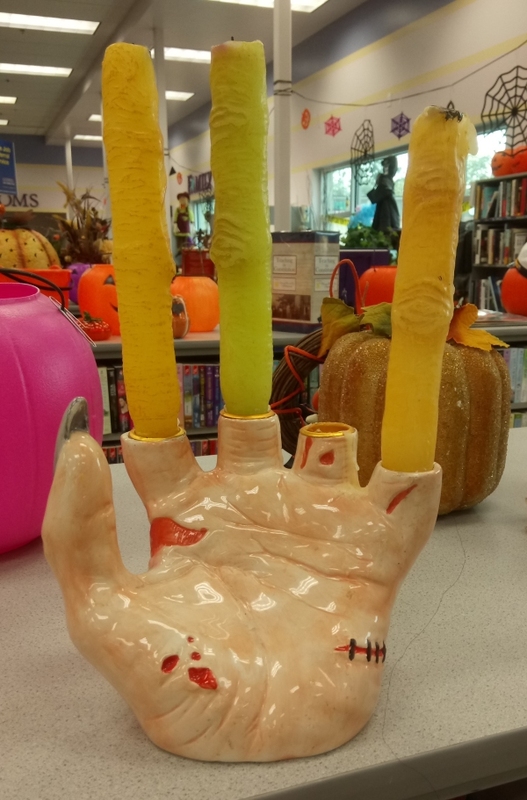 Not only is the hand itself scarred and wounded, but the candle fingers come in variable corpse-flesh colors as if they died well before the rest of the hand. It's appropriate that they came to me with their tips melted off and one of them missing entirely, though I'd love to have seen what this looked like brand new. 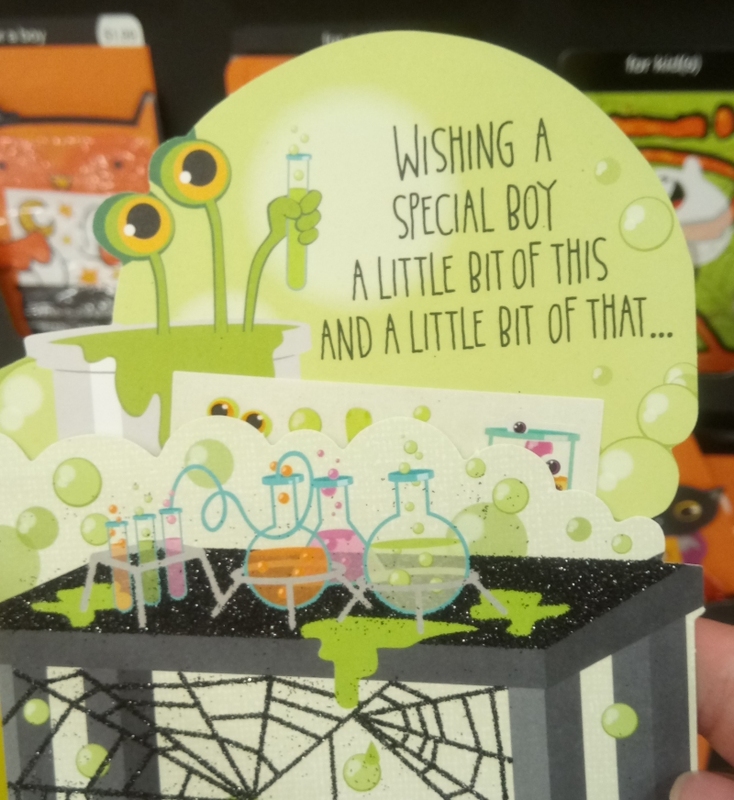 Something I missed at Target the first time around, this greeting card features a living beaker of slime with eye stalks, and he even appears to be performing a chemical experiment of his own! Does that qualify this thing as a mad scientist itself? It's easily the best-ever design for one, in that case. 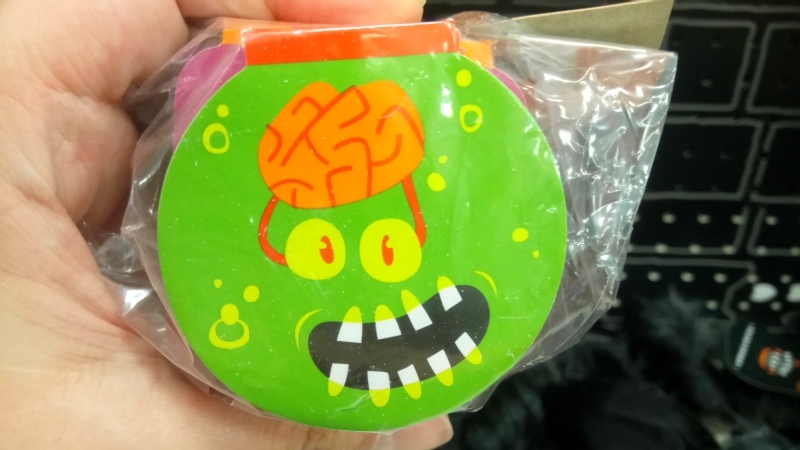 Along fairly similar visual lines, these little mini notepads include a design with just a brain, eyes and teeth in what appears to be a slime-filled fishbowl! 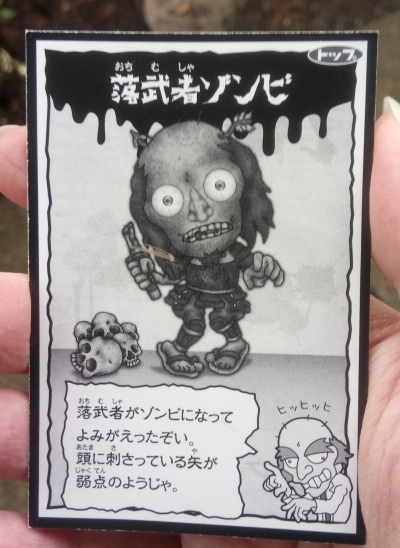 A friend sent me this in the mail, so I don't even really know where it originally came from! 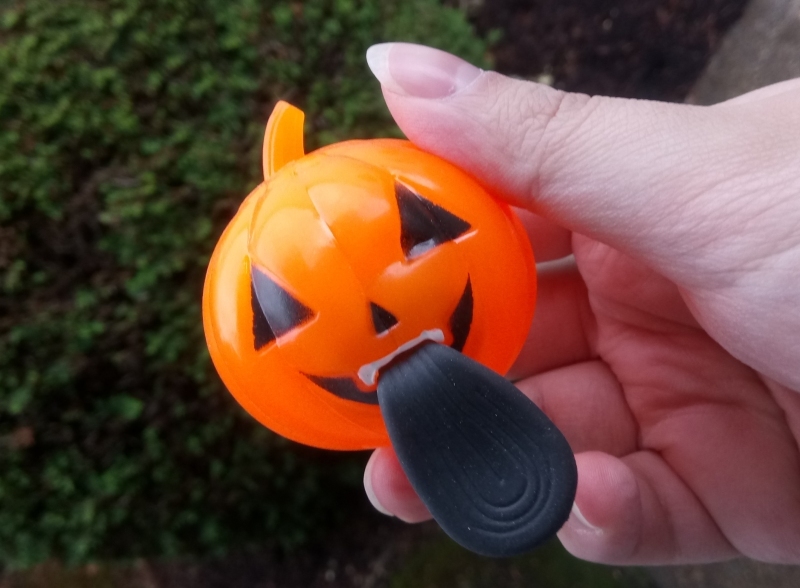 Bounce it off the floor and it'll flash various colors, which has become a fairly common category of toy, but it also has a stretchy, gooey black tongue you can use to "slingshot" the whole pumpkin at higher velocity. 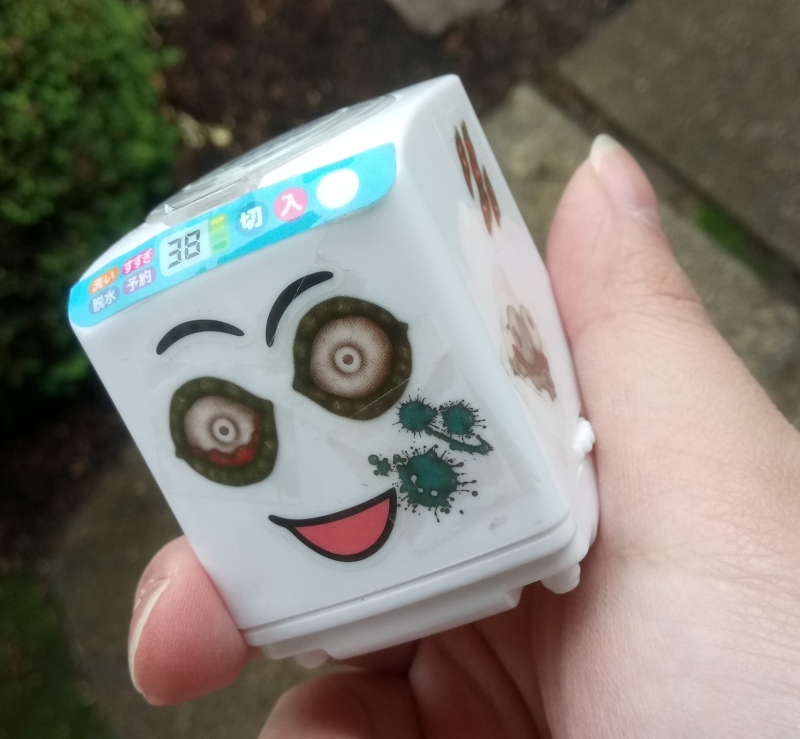 The same friend sent a Japanese candy-filled washing machine, obviously by the same company as the toilet I reviewed months back, but this washing machine's ghoulish facial features aren't really its own! 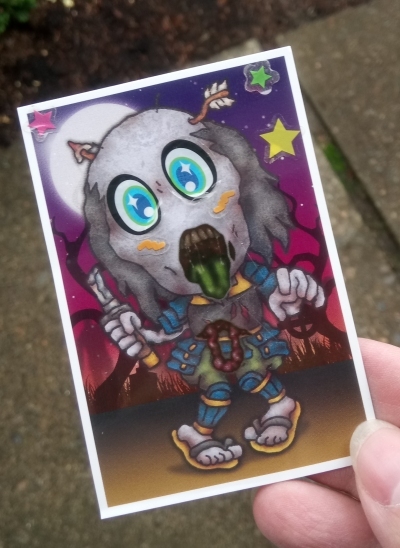 The washing machine's intended eyes have been completely stolen by this customizable zombie card, apparently part of a whole series headed by some sort of mad doctor mascot! 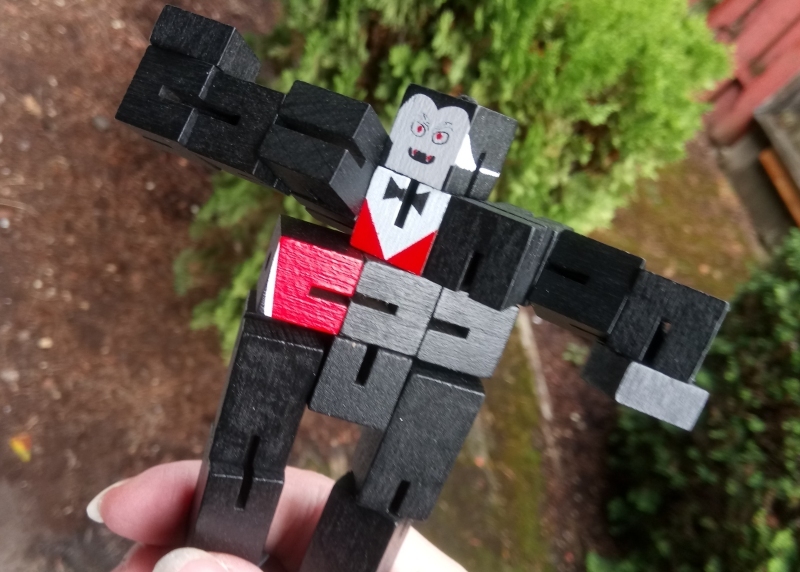 There were many other little things in the same surprise package, but one more that seems pertinent to discuss is this vampire made entirely of wooden blocks. I know this is a type of puzzle painted into all sorts of different characters and animals, but I like to think there's really a wooden-block dracula man somewhere out there. I don't know how being made of wooden blocks would play into any of his vampiric activity, but I'm sure he'd get an extra edge out of his victim's sheer confusion. 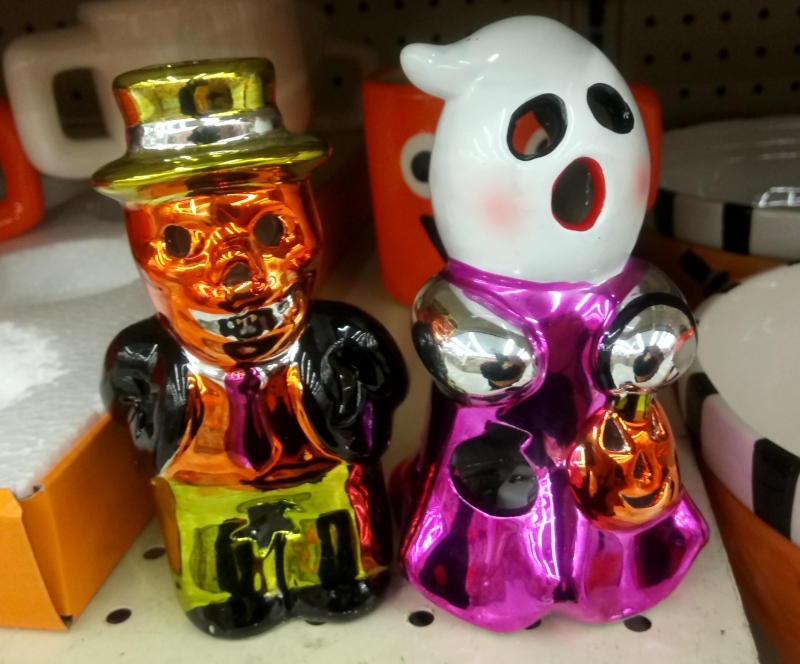 These little light-up figurines might not be that interesting if not for their incredibly gaudy, shiny color schemes, and it's hard for me to pick a favorite between the fat, dapper skeleton and the sheet ghost in a purple dress. Did I really forget to include this one in my Wal Mart post?! It pretty much speaks for itself. A big giant skull stuck farting in a toilet seems like one of the worst possible afterlives, but he really doesn't seem that displeased by it. He's clearly only upset that you've interrupted him, which leaves you wondering not only what kind of person he once was for this to be his eternity, but how much you might regret finding out.